Now that you’ve got an awesome domain name, you’ll never have to have a boring generic email address again! The “Email” section of cPanel gives you plenty of tools for managing every aspect of your email – from adding new accounts and dealing with spam to creating mailing lists and auto-responders. Select the proper domain name from the drop-down field. If you haven’t added your domain name to cPanel yet, you’ll need to do that first. Create a password – make sure it’s a secure one! Adjust the Mailbox Quota for the account. Remember: emails take up space on your server, so you may not want to give everyone unlimited access. 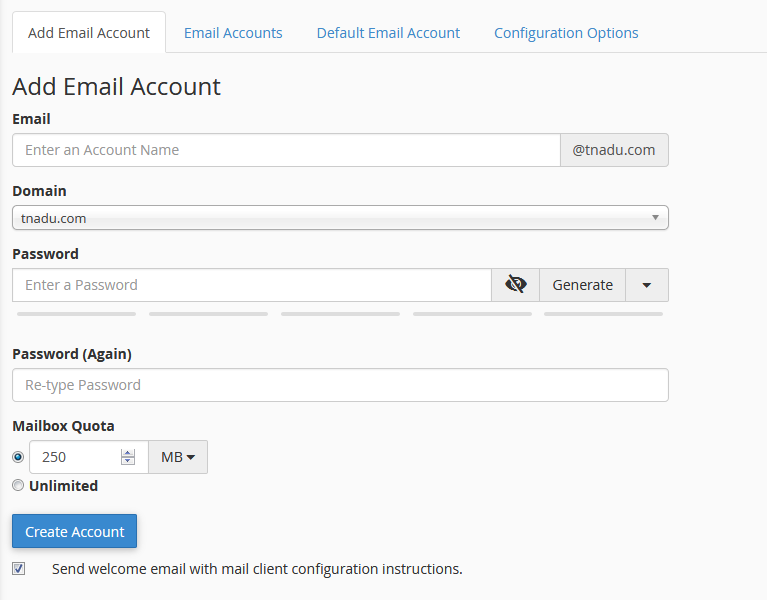 You can manage every element of that account, including the password, quota and mail client. Now that you’ve set up an email account – how do you use it? While we can’t cover setting up a mail client (like Google Apps, Microsoft Outlook or Mozilla Thunderbird) in this guide, we CAN give you a super easy way to get access to your webmail.